The 2019 Kia Sportage shatters expectations. Its striking tiger-nose grille, elegant side contours, prominent wheel arches, coupe-like roof, extended wheelbase and satin silver touches achieve a precise balance between luxurious sophistication and dynamic sportiness. Elongated headlights sweep back gracefully into the body, perched above a distinctive tiger-nose grille and available quad LED fog lights that invite adventure. The available slim, horizontal LED Rear Combination Lamps complement the swept-back headlights. The available High Beam Assist goes one step further by automatically dimming the high beams when oncoming vehicles are detected. The Sportage puts you at the center of its universe with its angled console, displays, and ergonomically-optimized buttons. Available on all trims, the Dynamax All-Wheel Drive system senses and adjusts traction requirements for changing road and weather conditions. Take your pick from two four-cylinder engines: the LX and EX come standard with a high-output 2.4-liter engine that is among the segment leaders, while the SX Turbo model gets an even more powerful turbocharged 2.0-liter engine. And the 6-speed automatic transmission delivers a smoother, more efficient ride. Its available Smart Power Liftgate opens automatically by sensing your key, giving you hands-free access to the cargo area. 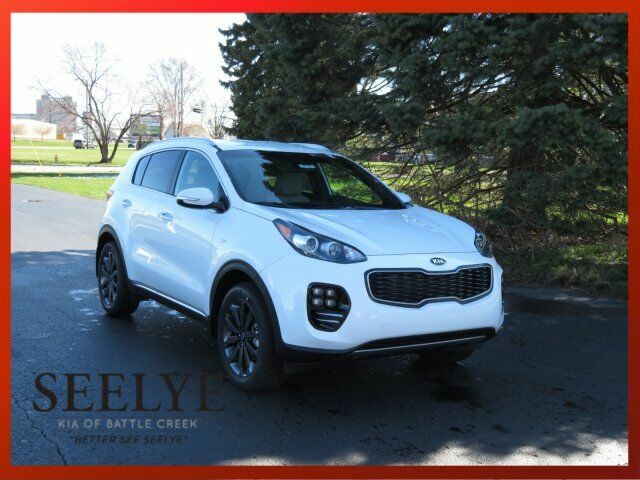 The Sportage offers a range of convenient features including Apple CarPlay and Android Auto compatibility and a premium sound system. Youll also find a comprehensive suite of safety features such as autonomous emergency braking, blind spot detection, rear cross traffic alert, lane departure warning and more.